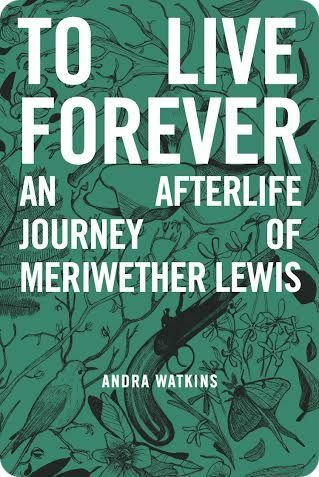 I’ve had to think long and hard about how to write a review of Andra Watkins’ “historical fantasy” novel, To Live Forever: An Afterlife Journey of Meriwether Lewis. I put historical fantasy in quotes simply because, to me, it is such an odd juxtaposition. History is supposed to be truth, fact-based; fantasy is its antithesis. At least, that’s what I thought before I read To Live Forever. Watkins’ power with language, character development, and setting was so strong that I basically bought the whole story line—hook, line and sinker. My disbelief was not only suspended. It was hung out to dry. The story begins in 1977 and shifts seamlessly among the points of view of Meriwether Lewis, who has been doomed to a kind of purgatory (Nowhere) since his death; Emmeline, a little girl whose mother tried to sell her to the highest bidder; and the highest bidder, the Judge, who also happens to be Lewis’ nemesis from his own day. It is Lewis’ mission to rescue Emmeline from the clutches of the Judge (who believes that his dead wife’s spirit resides in the little girl) and bring her to her father, last known to be in Nashville, TN. After managing to get out of New Orleans and up the Mississippi, they set out on the Natchez Trace, a road too familiar to Lewis. The Trace is the pathway to where Lewis met his death at Grinder’s Stand. Although Meriwether Lewis’ death in 1809 still has not been officially resolved, Watkins draws a picture of a man who was less likely to kill himself than he was to be killed. He had much to be proud of and much to live for; yet, he had enough enemies, political enemies, who would have been happy to see him dead. Even if the reader continues to doubt, in To Live Forever, Lewis names his murderer, as if Watkins wanted to put the matter to rest. I have to admit, given the circumstances of Lewis’ death, calling it a suicide seems more fantasy than anything in the novel. Lewis and Emmeline’s journey is fraught with danger at almost every turn, with cameo appearances by other “ghosts” who aid and abet Lewis and Emmeline, and with the occasional light moments such as the image of Emmeline dancing around in her Wonder Twin costume. The tension in the story is often as thick as the air in a Louisiana swamp so these light moments are welcome. The story’s pace is fast, as you would expect when two characters are running from danger to what they hope is safety for one and salvation for the other. As with any psychological journey, though, what stays with the reader is the growth of the characters. Watkins has Emmeline’s temper tantrums and endless curiosity down pat, but the little girl’s efforts to act mature, to make Lewis and her daddy proud of her are bittersweet because they ring so true. Lewis himself displays such complexity of emotion as he gets closer to having to give up Emmeline that one can’t help but think he did choose Watkins to tell his story. To Live Forever is an adventure. It is a new experience. It is discovery. I highly recommend purchasing the paperback version of To Live Forever. The illustrations by Helen Rice are lovely and make the printed book itself a work of art. This entry was posted in Book Promotion, Writers Helping Writers and tagged Andra Watkins, historical fantasy, historical fiction, Meriwether Lewis, Natchez Trace, novel, To Live Forever. Bookmark the permalink. Well, your thinking long and hard, paid off, Marie…what a great review! Audra is awesome! Exceptional! Sounds so interesting. Makes me want a copy in my hands right now. Great review, I’ve heard about this book. Just a few chapters in Marie, but I’m loving it so far! Great review. I think this is always helpful to steer us to a great book! I love blogging when I get to meet real authors and it always gives me courage to keep on writing, too! Thanks for this! !